The Hours and Days of Work Minors May Work in Wisconsin (Spanish) is a child labor law poster by the Wisconsin Department Of Workforce Development. This poster is mandatory for some employers, including employers of minors. This poster, written in Spanish, must be posted in a conspicuous place by all employers that employ Spanish speaking minors so that all minor employees can see it. This poster describes the restrictions on the hours of minors for Non-School Weeks and School Weeks as well as Non-School Days and School days. This poster also describes what minors need to acquire before they can work as well as the minimum they can be paid. WI All-In-One Labor Poster: Instead of printing out dozens of posters, employers can also purchase an all-in-one poster that covers both Wisconsin and Federal poster requirements by clicking here . It appears you don't have a PDF plugin for this browser. Please see the link below to download wisconsin-erd-9212-s-p.pdf. asistir a la escuela bajo el Estatuto de W isconsin  § 118.15.
menores de menos de 16 a ños solo pueden trabajar seis dí as por semana. que trabajen. Para m ás infor mación, vea la Guia de Empleo de Menores de Wisconsin. (ERD -4758- P). exigente de las dos leyes. orientaci ón vocacional organizados por su escuela. día aún cuando pueden trabajar para más de un empleador durante el mismo día o  la mis ma semana. comida  sin deberes de 30 minutos. entre e l fin de un turno y el comiezo del próximo turno. $5.90 por hora durante los primeros 90 dí as de empleo. En el día 91, el salario debe subir a $7.25  por hora. U.S. Department of Labor, Wage & Hour, 740 Regent Street, Suite 102, Madison, WI  53715. Madison  al (608) 266- 6860 o en Milwaukee  al (414) 227 -4384.
usando los números de TTY provistos. There are an additional sixteen optional and mandatory Wisconsin labor law posters that may be relevant to your business. Be sure to also print all relevant state labor law posters, as well as all mandatory federal labor law posters. 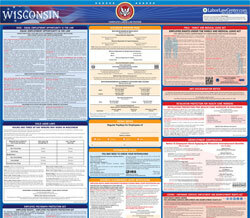 Instead of printing out pages of mandatory Wisconsin and Federal labor law posters, you can purchase a professional, laminated all-in-one labor law poster that guarantees compliance with all Wisconsin and federal posting requirements. Fully updated for 2019! While we do our best to keep our list of Wisconsin labor law posters up to date and complete, we cannot be held liable for errors or omissions. Is the poster on this page out-of-date or not working? Please let us know and we will fix it ASAP. LaborPosters.org will email you a printable PDF of this Wisconsin labor law poster, 100% FREE. You'll also get notified when new posters are available. Your Wisconsin poster has been downloaded and emailed! This poster download is provided as-is, with no warranty or guarantees. Please verify with Federal and Wisconsin authorities to confirm that you are posting all of the correct (and updated) posters required for your type of business. Instead of printing out pages of mandatory Wisconsin and Federal labor law posters, you can purchase a professional, laminated all-in-one labor poster.